LondonJazz: You have four London performances in February and March, right? M&K: William Blake was born in Soho in 1757. A poet and artist regarded in his lifetime as eccentric and politically dangerous, Blake is now acknowledged as one of the great visionaries in British Art whose work resonates strongly in the 21st Century. Many of the songs that form the basis of Glad Day derive from ‘Tyger’, Adrian Mitchell’s musical about Blake, which was staged by the National Theatre Company in 1971, with specially commissioned music by Mike Westbrook. An original Cast recording was released at the time on RCA. LJ: It's gone through a number of transformations and revisions over the years hasn't it? M&K: In 1977 this material formed the basis of Mitchell’s Glad Day, a Thames TV music drama which marked the 150th anniversary of Blake’s death, in which the Mike Westbrook Brass Band participated. By then the Blake songs has become an integral part of the repertoire of the Brass Band on tours throughout Britain and Europe, on radio and TV, and particularly associated with singers Phil Minton and Kate Westbrook. Four of the songs were included in the Brass Band’s 1975 album For The Record. More William Blake material was added, and in 1980 Bright as Fire, a programme devoted entirely to Blake settings, was recorded (available on Impetus Records) and thereafter performed many times, notably at St. Peter’s Church in New York in 1983 and at the Adelaide festival in 1984. Other artists who have recorded Westbrook’s settings of Blake include Van Morrison and folk singer Frankie Armstrong. LJ: And there's a choral version of the songs too? M&K: In 1996 The Brass Band re-assembled for a revival of the Blake programme at the Greenwich Festival, For the first time a choir took part in a ‘live’ performance – the Senior Girls Choir of the Blackheath Conservatoire of Music and the Arts. Subsequent performances which included festivals in Salisbury and Dublin, always involved a local children’s choir. The album Glad Day, which includes six pieces not on the original recording, was released on Enja Records in 1997, funded by an award from the Airshaft Trust. Mike’s first fully choral arrangements were written for the Flemish Radio Choir, for a festival in Antwerp in 1998. These formed the basis for a radically new approach to the Blake material when, in 2007, Glad Day the Choral Version was given its first performance at the Foundling Museum, London, as part of the St. Pancras Festival of Contemporary Church Music marking the 250th anniversary of the birth of William Blake. LJ: Is there a DVD coming? The Poetry of William Blake Filmed in concert at Toynbee Hall, London. LJ: For your performance at St-Giles-in-the-fields, you're working with the Simon Community. Do you have a special affiliation with them? M&K: This is our first collaboration with the Simon Community. We admire their work enormously. LJ: As well as the London concerts, in February you are playing near Bordeaux? LJ: Mike, you will be doing some work with the Guildhall School in March. MW: March 26th will be a lunchtime concert with saxophone students at the Guildhall. I’ll be working with the students on a mixed repertoire of my compositions and arrangements. LJ: Both you and Kate will be performing with the Guildhall Jazz Ensemble on the 27th. What will you be playing? M&K: We’ll be performing an expanded version of our piece ‘Waxeywork Show’ with a large multi-instrumental ensemble. This version has not yet been performed in the UK. LondonJazz: What else is coming up? Mike and Kate: Dates with the Westbrook Trio with Chris Biscoe, still Celebrating our 30th anniversary, and the release of the “Three into Wonderfull” CD. We’ll be playing in London, Italy and Switzerland. The London date is on Wednesday 5th March presented by Way Out West at the Bull's Head. On the, 22nd March Kate and I go to Aachen for a concert with saxophonist Heribert Leuchter in his Musik Salon Lux series at Schloss Rahe. The Mike Westbrook Big Band is now based at the Barnfield Theatre, Exeter . The band will be giving concerts around the SouthWest throughout the summer, including performances of a new version of Big Band Rossini. Kate and Mike's Glad Day DVD will be on sale for the first time at the St Giles-In-The-Fields concert, and will be available from their website soon. 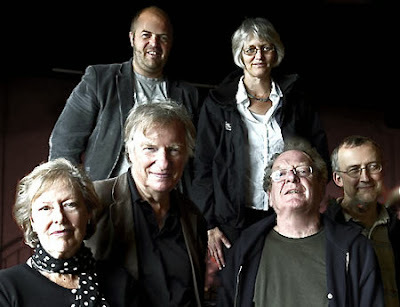 What a pleasure it would be in this centenary year to have the new Exeter-based Mike Westbrook Big Band ressurect what I think is his masterpiece - 'Marching Song'.